Civita Castellana  is a city in the north of Lazio in Italy. 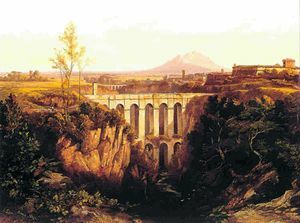 An 1844 painting of Civita Castellana by Edward Lear, of limerick fame. Civita Castellana was settled during the Iron Age by the Falisci, who called it Falerii. They were not Etruscans, but a distinct group, said to have been of Greek origin. They were culturally different from the Etruscans, but often their neighbors, allies and trading partners. Civita Castellana/Faleria was already important 3000 years ago, and was protected from invaders by its high position and surrounding stream and cliffs. The Romans defeated the Falisci in 396 BC and in again in 241 BC after a revolt by the locals who were then required to build a new, less defensible, city about 5 km away. This two was known as Falerii Novi (see Get Out). The original city was repopulated in the early Middle Ages because it offered greater protection, and it adopted the new name of Civita Castellana that was first mentioned in 994 AD. In the following centuries the city was a flourishing independent town with its own bishop. NORTHERN LAZIO: AN UNKNOWN LAND, by Wayland Kennet & Elizabeth Young. It features alphabetically arranged chapters on most of the towns in the province and it is a beautifully researched and written volume based upon experience and a love for this area. At the back of the book is an amazingly useful matrix rating each of the towns for sites of all periods worth visiting, as well as many other factors. Civita rates second only to Viterbo in their rankings of visit-worthiness. This book was published in the UK in 1990, and a year later in Italian. The Italian version is very difficult to find. Be mindful of the fact that the scope of this guide is historical/factual. It cannot pretend to be a great guide for painters. Kennet hardly rhapsodizes about views of the landscape. The best source for information for places and views to paint is in the paintings themselves that were executed in this area. Civita Castellana is located about 60 kilometers north of Rome. By car from Rome’s ring road, the GRA, take the SS2bis (known as the Cassia bis or the Cassia Veientana) until Gabelletta/UMILTA' and then the SS311 in the direction of Nepi. Civita Castellana can also be reached by the Italian state railway from Tuburtina/Trastevere stations (not Stazione Termini) to Civita Castellana/Magliano Sabina. Locally this station is known as Borghetto for the frazione of Civita in which it is located. The local bus company, Vitertur, operates a service for commuters to the center of Civita. Tickets can be bought in either of the bars at that station for the sum of one euro. If the train is very late, you will have missed the bus. Ask fellow arriving passengers if they are driving to CC! They are often quite happy to give you a lift into town! The MetRoma service from Piazzale Flaminio/Piazza del Popolo in Rome is limited to peak commuter travel hours and takes about 90 minutes to reach CC. The last half hour is stunningly beautiful but the trip overall is longer than it should be if the track were doubled or if the line had not been made to take the scenic route around Monte Soratte over 100 years ago. The local bus company, COTRAL, connects Saxa Rubra station to CC via the towns north of Rome along the Via Flaminia. Daily tickets cost €9.50 return (biglietto giornaliero) and can be used on the state railway, Cotral bus and the Metroma service (as well as all over in Rome if originating from CC). Arrive early and try to get on the car furthest from the train station. Single tickets for this train are a between 4 and 5 euros and can be bought at Piazzale Flaminio station. There is a train that connects CC to Fiumicino airport directly without changing in Rome. It is primarily a commuter train, so there are few mid-day train services from FCO to Orte, and it can get very crowded in peak hours, but you will always get a seat leaving from the airport. The schedule is somewhat limited, and the train terminates in ORTE, two stops beyond CC, but does also obviously stop in CIVITA CASTELLANA. The train leaves you at Civita Castellana/Magliano Sabina, and the station there is locally referred to as "Borghetto" - the zone of Civita in which it is found. Cost of this ticket is about 11 euros each way, tickets can be also be bought at the newspaper stand in the airport train station so don't waste time lining up at the ticket office if it is crowded. Be sure the destination indicted on the train and on the destination display board is ORTE, and not Fara Sabina, an intermediate terminus of this service which will strand you in the middle of the Sabine Hills still very far from CC. Set an alarm - you will be tired after your trip and dozing off on that train is likely to result in missing your stop. Signs for stations are very difficult to read from inside the train and seldom announced. CC/Magliano Sabina is the stop right after COLLEVECCHIO. From Borghetto, you can take the little Vitertur bus into the center of town, using a ticket you can buy for one euro at the bar there across the parking lot from the station. Be sure to tell the driver you are getting a ticket so he will wait for you. The Vitertur bus schedule is linked to train arrivals. Sadly, if the train is very late the bus does not wait. Weekends there is no Vitertur service (commuters!). As a last resort, look pleadingly at other people arriving since they will often help you into town in their cars if asked. Repeating Civita Castellana with a questioning tone and a smile might be all you need to get into town, a ten minute car ride away. You can walk into town, arriving the next day, traffic permitting. Note that there is no sidewalk along the route, and it is very hilly. Be careful not to take the Leonardo Express service from the train station at the airport by accident. It is faster, and more expensive, but only goes as far as Rome's main station, Stazione Termini. It is normally departing from the track (there are only two at this airport) on the right hand side, while the Orte-bound train (that stops at CC/Magliano Sabina) normally departs from the track on the left. Check carefully before alighting and make doubly sure to "convalidate" your ticket in the yellow machine. In case you forget, write on the ticket in pen: station where you got on, time you boarded, date you are using the ticket, all of which can prevent you from being fined for not "convalidating" your ticket at the station to the tune of 50 euros or more as well as scornful looks from other passengers and ticket checkers. Getting around is best accomplished on foot (for daily needs), or by car. METROMA services Civita with the Roma-Viterbo trainline, which takes 90 minutes from Civita to Piazzale Flaminio/Piazza del Popolo. A scenic, but slow route used by students and folks who work in Rome. Therefore there are many options very early in the morning (last departure from CC at about 8 a.m., then a gap in service to Rome until lunchtime, then return trains from Rome after school/work hours). It is derisively referred to as "La Freccia Viterbese" to satirize its slowness. Note that service is somewhat reduced in summer due to fewer students needing the train. Also note that festivo service is strictly Sunday and holidays. Day tickets from Civita Castellana are 9.50 euros, but this includes back and forth to Rome, as well as all buses, subways and trams around Rome. This daily ticket cannot be used to get all the way to Fiumicino airport. The Cathedral of S. Maria Maggiore, (Il Duomo). This is a very attractive building. There is considerable Cosmatesque work (geometrical floor mosaics) both inside and out. Uniquely, this duomo has a Cosmatesque facade (signed and dated in gold mosaic tiles, dated 1210) as well as Cosmatesque floor mosaic work. These patterns were created in the Middle Ages from thin slices cut from colored marble and columns left in the ancient ruins. The name derives from a Roman family, the Cosmati, who did this sort of work. Similar Cosmati floors can be found in Rome, Anagni and Spoleto. The high altar is fashioned from a sarcophagus of the 3rd or 4th century. The ancient crypt is fascinating and well worth visiting. Sadly the interior was redone in the 1740s but retains many of its antique marble columns. The organ is the same one on which the young Wolfgang Amadeus Mozart played. Outside, the effect of the beautiful portico, dating back to 1210, is somewhat spoiled by the modern fence that protects it. To see what the original interior would have looked like, visit the Basilica at nearby Castel Sant'Elia. The fortress (Forte Sangallo). This fortress was built by Pope Alexander VI and completed by Julius II with the erection of the octagonal keep. It's an excellent example of military architecture and is still very well preserved. In the early 19th Century it served as the main prison for northern Lazio and became known as the Papal Bastille as it confined many Italian patriots. It now houses the local Etruscan Museum (though most of the Faliscan and Etruscan finds from the area enrich the collection of the Villa Giulia in Rome. Open daily, except Monday, it can be toured free of charge after signing the visitors book. Doors open every hour on the hour, last entrance at 6 p.m. Several days of the week you can now go directly to the "mastio" - the imposing tower and its roof for stunning 360 degree views over the surrounding countryside. Great local ceramics at the shop of Vincenzo Dobbolino (aka Mastro Cencio). His store is an Aladdin's cave of skilled reproductions of classical wares - Etruscan, Greek, Faliscan, medieval, as well as his modern, original pieces. The shop is impossible to miss if coming from the main free parking lots as the result of a newly executed facade that looks like a giant version of a red-figure vase. Vincenzo is also knowledgeable about local topography, history, flora, fauna and hiking trails. He will lead you on a tour for a modest fee (to cover his expenses and time) and has a sunny and pleasant disposition. A true artisan and a gentleman. Civita suffers from a dearth of central, affordable accommodation. The Relais Falisco  is a very nice example of this French chain's service, located in Via Don Minzoni, just 50 meters from the Duomo. It is situated in the renovated Palazzo Feroldi delle Rose and is air-conditioned and staffed by helpful receptionists who all speak English. Approximately forty rooms, both singles (seven) and doubles, include a breakfast buffet. The hotel has wifi as well as private parking for guests. They also have conference rooms for meetings or private courses. There is a new B&B - Le Piagge just above the Pane e Pomodoro restaurant rear entrance. This is a small (3 double bedroom) B&B, each room is newly renovated and has its own bathroom. Breakfast is served (self-service) downstairs, though a new kitchen is being added. Wifi, parking outside in gravel lot, air-conditioning in communal spaces. One room has a view of Monte Soratte. Book by phone 0761 971971. Another small B&B has opened recently: Le Nuvole, just down from Piazza del Duomo in Via Don Minzoni, 34. Book by phone or email: 0761-515919. The other "local" accommodation is well outside of town. Civita Castellana has a rich history, and was for centuries one day's ride north from Rome along the Via Flaminia - a place to stop and change horses. Civita is a superb base from which to explore Northern Lazio (by car).It was also one of the first locations that drew outdoor painters in the 18th century, and many of the views they painted are still unspoiled today. The local building material is mainly tufa, and the region is full of tufa cliffs and gorges, Etruscan burials and wonderful small towns. Most amenities are within easy waking distance here in the old center of this ancient town, historically the center of the Faliscan empire. The Faliscans were contemporaries of the Etruscans and Civita finally fell to the Romans in 241 BC. It is built on a naturally defensible bluff. Civita also has a wonderful Antonio da Sangallo fortress built around 1500, which was a Papal palace and then a prison, and now a museum displaying Faliscan and Roman relics, where there is a free music festival every July. There are wonderful things to see all over the region: Viterbo has one of the best preserved medieval centers in Europe and the Terme dei Papi bath complex, Sutri, Calcata, Nepi, the Via Amerina (an ancient road lined with burial chambers carved into the rock), Monster Park at Bomarzo, Villa Farnese at Caprarola, Villa Lante at Bagnaia, nearby Castel Sant'Elia with its 12th century Basilica and Sanctuary, the beech forest - La Faggeta - near Soriano, where the Romans came to capture wild animals for the sport in the Colisseum, also Amelia, Calvi, Otricoli, Lago di Bracciano, Lago di Vico, Faleri Novi, Oriolo Romano, Vignanello, Vasanello, San Martino al Cimino, Bolsena, Montefiascone, Tuscania, Civita di Bagnoregio. So many wonderful and uncrowded places to visit. It's a wonderful area to be based to see the wonderful Renaissance gardens of Lazio as well, and is near enough to the main A1 highway to allow day-trips to such places as Perugia, Orvieto, Todi, among others. Good coffee, food and wine and many festivals celebrating local food and traditions all summer long. Tuesdays and Fridays there is a smaller fresh fruit/vegetable market in the old part of town, and on Saturday mornings there is the big fresh market in the new part of town. The best way to explore the area surrounding the town is on foot. There are superb trails down to and along the many rivers that have always defined this area. Descending into the surrounding woods is truly like stepping into the countryside as it was 3000 years ago. The locals are friendly! Falerii Novi is 6km west of Civita Castellana. It is situated on a slight volcanic plateau. There are extensive walls, considered to be excellent examples of Etruscan/Roman city walls. The ancient Roman town boasted fifty towers along these walls. Built out of huge blocks of tufo rock, they are about 2km long. S. Maria of Falerii was built around the 12th Century. The church has been restored and can be visited weekends. The adventurous can reach Faleri Novi by following the Via Amerina from just outside Civita (leaving a car at the parking lot of the Quercia restaurant) and proceeding through the countryside. Large stretches of the original wall are preserved but not well cared for. Best not to approach from the main roads as the land is both privately owned and grazed by sheep who are protected by tenacious sheep dogs who emphatically do not speak TOURIST! Calcata is a small town resting on top of a crumbling rock. Taken over by "hippies" in the '60s when the locals moved out, it is now a laid-back artists' colony with an interesting and diverse population. Be aware that Calcata is mainly closed during the week - shops and restaurants are generally only open on Saturdays and Sundays. Be prepared to park in the big lot in Calcata Nuova (a town of unique unattractiveness) and walk into the old, tiny town below - parking is difficult weekends. Just beyond Calcata are the falls of Monte Gelato near Mazzano and a hiking trail up to the ancient settlement at Narce. Calcata is connected to Civita Castellana by a trail through the Parco del Treja - a hike of approximately 12 kilometers, challenging in places, but beautiful, that follows the river bed, emerging along the Via Flaminia a few km outside of Civita. Due to the weakness of the local public transport system, you need a car to get to Calcata. This page was last edited on 13 June 2018, at 14:03.